In a matter of hours, the Washington Redskins will officially kick of the 2013 campaign when they face the Tennessee Titans in their preseason opener. Like every other ‘Skins fans out there, I too am exciting to see what this season has in store for the burgundy and gold and it’s a safe bet most of the day will be spent staring at the clock, wishing it was time for kickoff. To help pass the time, I’ve decided to take a quick look back at the roller coaster ride that was Washington’s ’12 season. 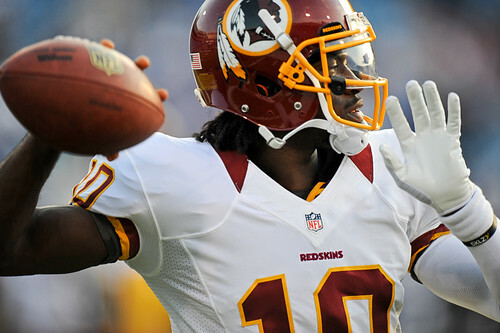 The highly-anticipated debut of Robert Griffin III. 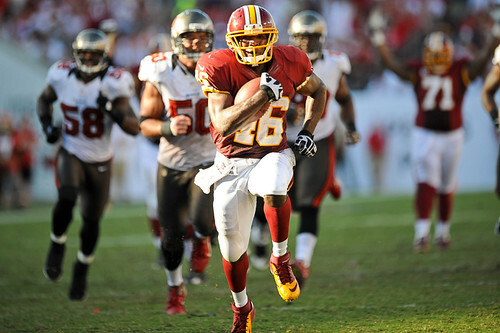 The improbable emergence of Alfred Morris. The horrendous start, followed by the amazing second-half surge. And best of all, I was on the sidelines for all 21 games — from the preseason opener in Buffalo to the heartbreaking postseason defeat at the hands of Seattle — it was easy the most compelling season I’ve been around the Redskins for since I began covering the team back in 2005. So without further delay, here is one final look back at the beginning of a new era of Washington Redskins football. Let’s be honest, no one remembers anything about the Redskins’ 7-6 victory over the Buffalo Bills except this — the beginning of the RGIII era in Washington. This provided locals with their first chance to see the Heisman Trophy winner face NFL competition, and although he wasn’t in the game very long, he definitely made a lasting first impression. 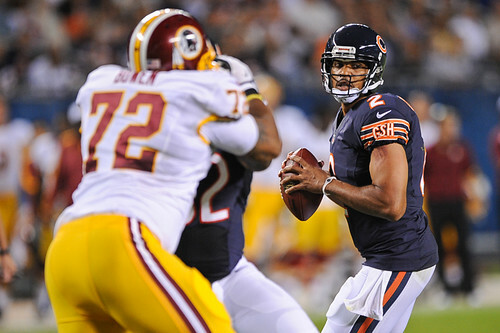 Nine days later, the Redskins traveled to Chicago and were defeated by the Bears 33-31. By the time the first quarter was over and the starters were done for the night, Washington trailed 14-0. But for me personally, the image that resonates with me is this shot of the last guy who was supposed to be the face of the franchise. 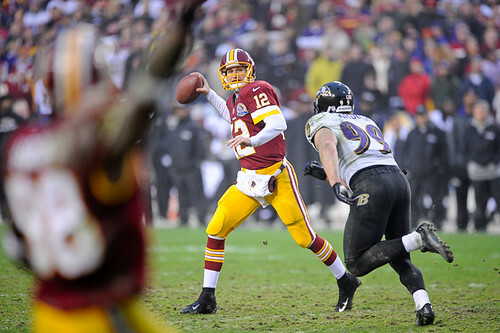 As all ‘Skins fans know by now, Jason Campbell was a great guy, but ultimately a disappointment in D.C. Seeing him in mop-up duty for the Bears only re-enforced that his career never really lived up to the draft pick used to select him. Between video games, fantasy football and countless other distractions, I feel like the human element of playing football is often forgotten. 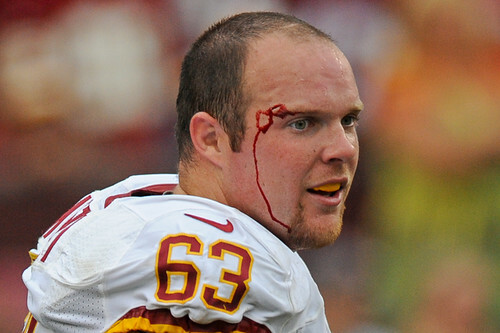 And then you see center Will Montgomery lose his helmet, continue to block his man anyway and, after the play is over, has to be told by a referee that he’s been busted open and is bleeding all over himself and it is a reminder that these guys are people too. Typically, the fourth preseason game is as meaningless as the Pro Bowl. Most guys you’ve ever heard of don’t even have the opportunity to play a single snap in the preseason finale, and yet, there was receiver Joshua Morgan, dragging multiple Tampa defenders as he readied himself for the regular season. It’s funny, the play that sent a message to the entire NFL is commonly remembered for the quarterback celebrating an 88-yard touchdown while seated on the playing field. 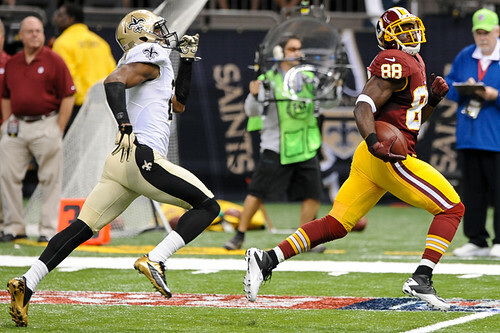 But not every sideline photographer was caught out of position and had to settle for photos of “Griffining.” Some folks, actually captured receiver Pierre Garcon out-racing the opposition for the statement touchdown. Receiver Leonard Hankerson tried like hell to drop this 68-yard touchdown, but the pass from Griffin was simply too perfect to screw up. 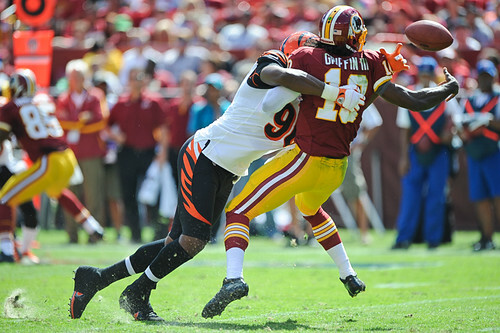 While the concussion and knee injuries garnered more headlines, Griffin took more punishment against the Bengals than against any other opponent in ’12. There were several times throughout this contest where I wondered if the Redskins were going to be able to make it out of the game with their quarterback still in one piece. Thankfully, the final whistle blew and he was able to walk off the field on his own. 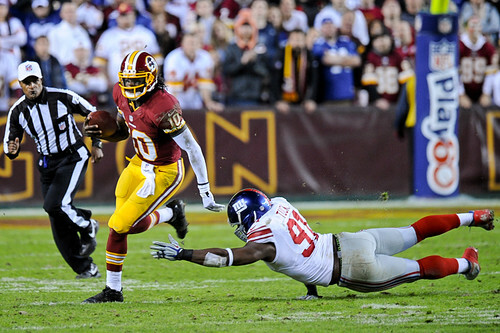 I love this photo of Alfred Morris. It’s as if the seas parted, a perfect path was cleared for the unheralded rookie and the football gods even lit the way to guide him into the end zone for this 39-yard touchdown scamper. Bonus points to Trent Williams who was already celebrating the score, even though Morris still had nearly 20 yards worth of field left to cover. 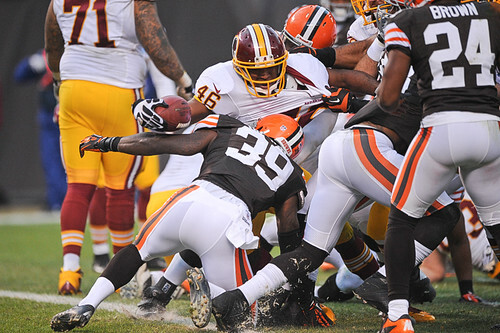 Linebacker Ryan Kerrigan opened the scoring with a 28-yard interception returned for a touchdown. Of course, this play was quickly forgotten when Griffin left the game in the second half after suffering a concussion when he failed to protect himself while running with the ball. For my money, the most riveting play of the 2012 season was when Griffin scored a 76-yard touchdown run against the Minnesota Vikings with less than three minutes remaining in a game they trailed 31-26. 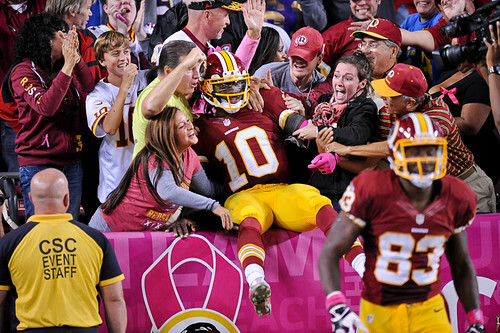 Judging by the reactions of the FedEx Field faithful, I wasn’t the only ‘Skins fan who seemingly enjoyed the play. Ug. 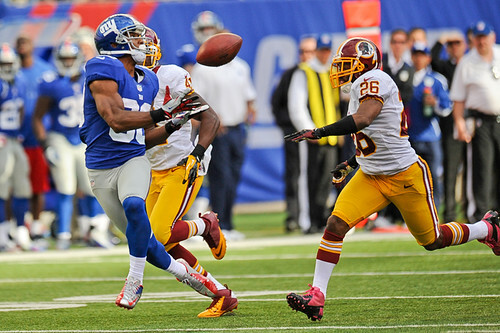 Victor Cruz makes the secondary look stupid with this game-clinching touchdown. Not fun times. 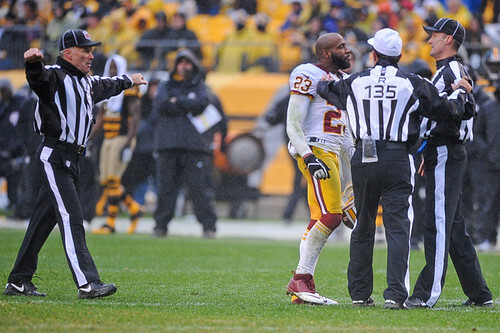 DeAngelo Hall being DeAngelo Hall. Also, the Redskins were thoroughly outclassed by the Steelers in Pittsburgh. And the weather sucked too. This one couldn’t end fast enough. 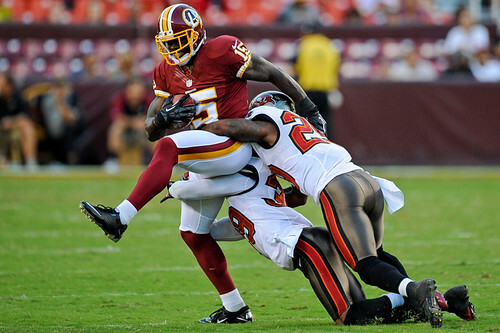 This was a game where it just seemed like the Redskins just couldn’t get out of their own way. 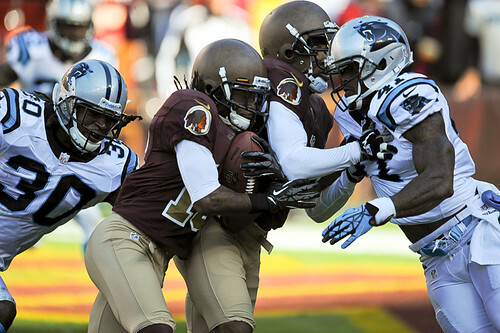 The Redskins lost to the lowly Panthers and found themselves 3-6 heading into the bye week. 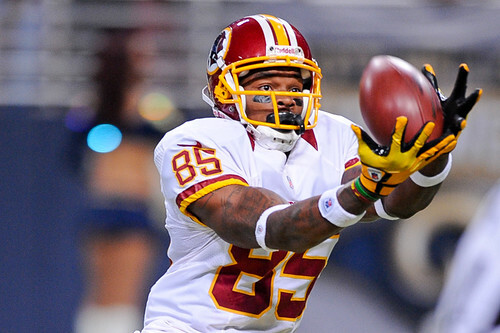 The second-half surge started against a bad Eagles team, and one of the highlights of the resounding victory involving veteran Santana Moss refusing to be tackled before reaching the end zone against Philadelphia. 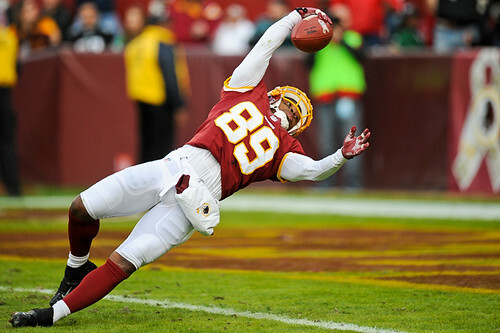 Moss never gave up on the play and the Redskins never gave up on the season. Kind of poetic, huh? Texas native Aldrick Robinson picked a fine time — a primetime game during Thanksgiving — to introduce himself to the football-loving world, hauling in a 68-yard score during a 28-point second quarter against the hated Dallas Cowboys. The Giants might have struck first, but the Redskins got the last laugh — outlasting New York at home, 17-16, in a game between two teams gunning for the NFC East title. Sometimes it’s better to be lucky than good. If Garcon had taken one more step to his right, he completely obstructs my view and I miss this shot of the key moment of this game. Instead, I was able to capture this amazing image where Garcon is so open, he’s frantically waving at Kirk Cousins to please deliver the football to him for this huge fourth-quarter score. 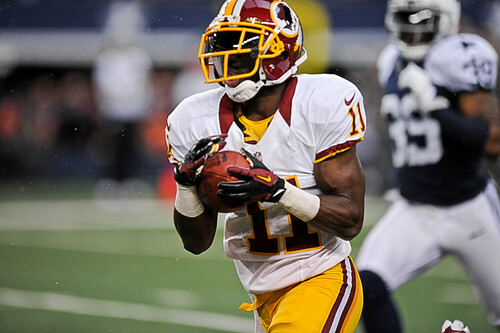 Without the benefit of RGIII, the Redskins turned to Morris early and often. In related news, the Cleveland Browns had no answer. 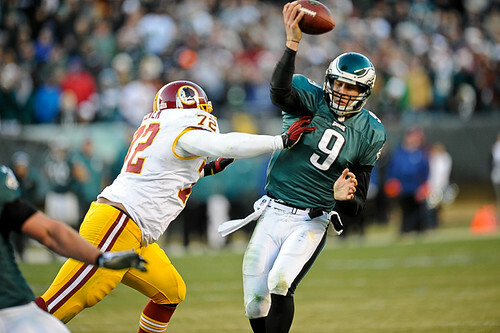 With the game on the line, defensive end Stephen Bowen pressured Eagles quarterback Nick Foles just enough to preserve Washington’s win and keep the team’s playoff hopes alive. 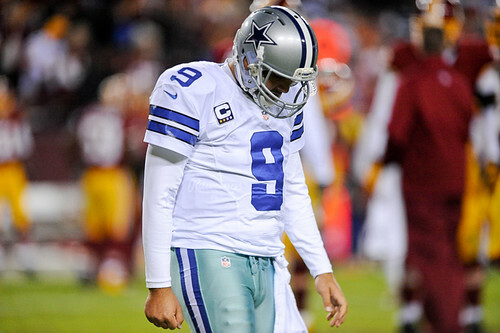 A “Sad Tony Romo” sighting! It must be December! 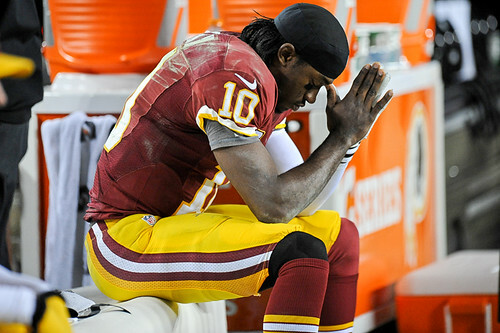 Like ‘Skins fans everywhere, Griffin bowed his head and said a silent prayer after being knocked out of Washington’s playoff game against the Seattle Seahawks due to a devastating knee injury. Of course, that brings us back to this evening’s game against the Titans. The last time the Redskins were in Nashville, Vince Young threw his shoulder pads into the stands and Clinton Portis got knocked out. Let’s hope, for the sake of everyone involved, the 2013 preseason opener is much more subdued. Redskins officially eliminated from playoffs. Again. The Josh Johnson feel-good story continues. 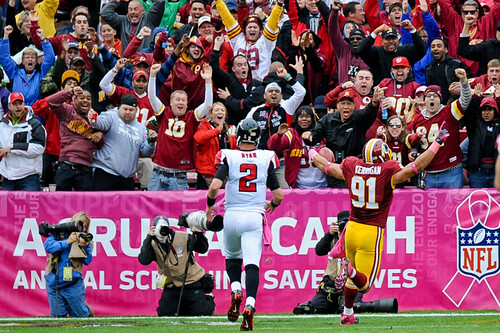 This November, Redskins have little to give thanks for. An ugly win is still a win, right?